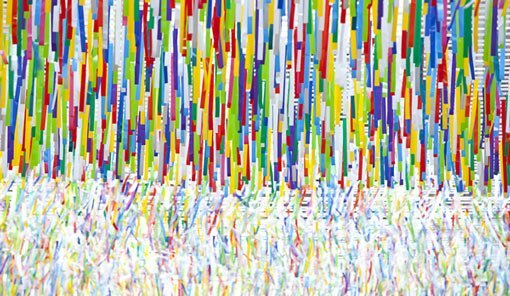 Nike Savvas Rush 2010 (detail). Photo credit Jamie North. Consisting of more than 60,000 strips of custom-sewn plastic bunting, Nike Savvas’ new work Rally is among the largest works of art ever exhibited at the Art Gallery of NSW. Rally will exist as a vast canopy of synthetic colour, a hanging garden of plastic some 60 metres long by 8 metres wide. Stirred by electric fans and the movement of viewers, this immersive artwork will send flurries of colour coursing unpredictably through the Gallery. Conceived for the Gallery’s most public space, the entrance court at the heart of the building, Rally is about the public life of art: about crowds, mingled colours, shared space and social energy. A rally is a public parade organised in protest or in celebration. Walking beneath this vast new work, viewers will take part in a rally of Savvas’ invention, drawn in and swept along by the force of colour in motion. Sydney artist Nike Savvas requires little introduction for many Art Gallery of NSW visitors. Exhibiting at the Gallery in 2006 in the 4th Balnaves Foundation Sculpture Project, Savvas filled a large room with more than 35,000 coloured polystyrene balls threaded on 713 lengths of nylon, and then set them all vibrating with two banks of industrial fans. Critic Sebastian Smee called it 'the most captivating piece of public art I have seen in Australia’. The walls flanking Rally in the entrance court will be rehung with a complementary presentation entitled Forcefields showcasing 11 vibrant abstract paintings from the Gallery’s Australian and international collection, all of which employ, as Rally does, opticality, energy and aggressive colour. The commission of Nike Savvas’ Rally allows the Gallery to directly foster the production of new art and simultaneously enrich the Gallery’s collection. This work complements the contemporary season at the Art Gallery of NSW, which includes Sol LeWitt: Your mind is exactly at that line , Khadim Ali The haunted lotus , and the 19th Biennale of Sydney: You Imagine What You Desire .